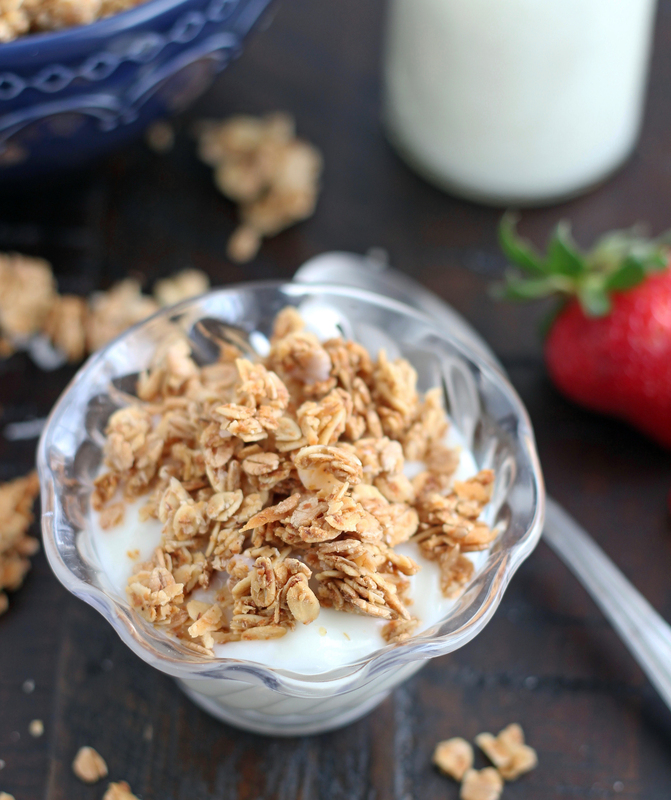 My Mom’s Homemade Granola is one of my all-time favorites. Simple, delicious and extremely addicting. Enjoy it by the handful, with milk, yogurt or even ice cream. I think one of the things I dreaded most about getting married and moving out was the fact that I wouldn’t get my mom’s cooking every night. She happens to be a fabulous cook/baker. She was constantly baking cookies, bread, cinnamon rolls, etc. and we always had a hot meal on the table (which is no small feat when you have 9 hungry kids to feed). My mom is pretty amazing if you ask me. 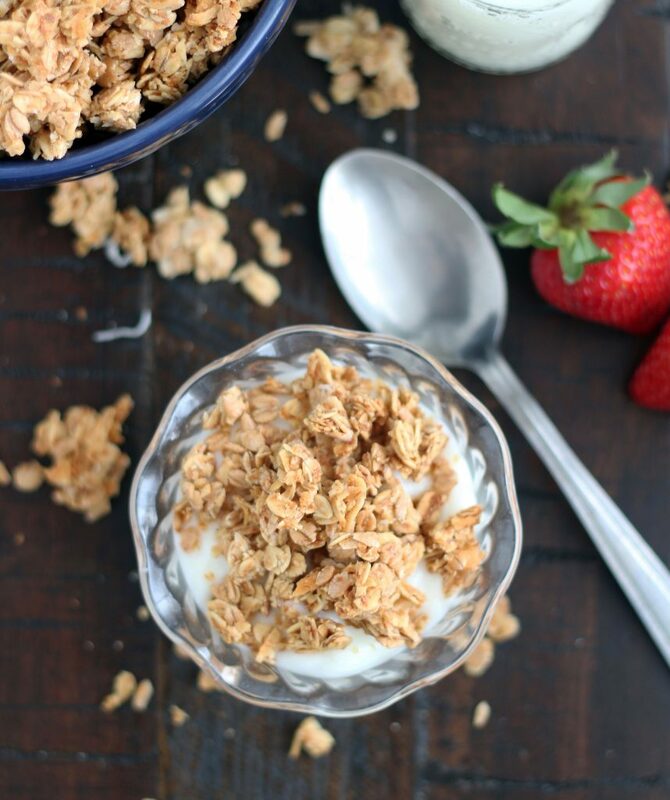 This granola is one of my favorite things I grew up with. It’s the best! I hadn’t had it for a really long time until a few years ago when she started making batches of it to give to all of us kids for Christmas. Can I just say best. gift. ever! I think some of my siblings may have even tried to make off with other sibling’s bags of this delicious stuff. When I asked Braydon if he’d want to eat what I “plated” up for pictures, without any hesitation he said “SURE!” I didn’t even have to twist his arm or bribe him :). 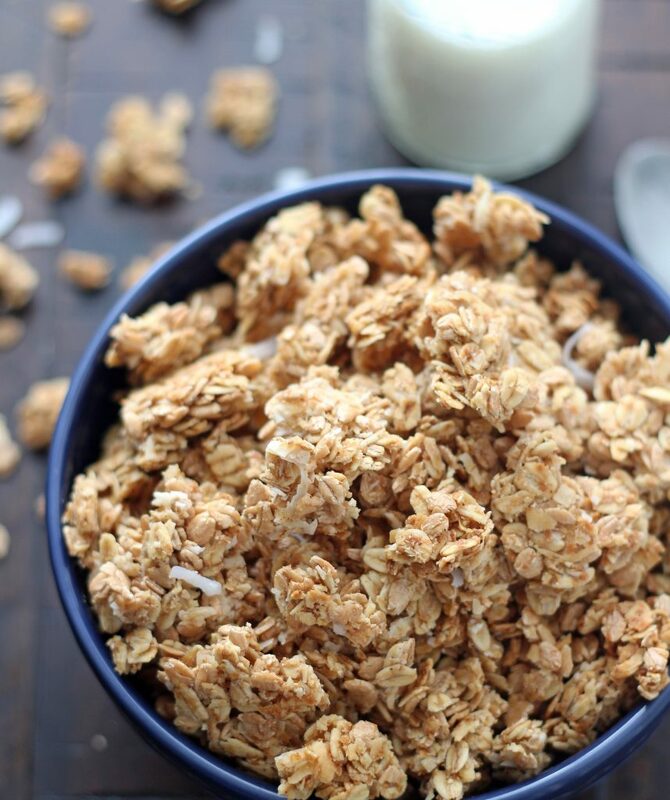 We love eating this stuff by the handful or sprinkled over yogurt or in a bowl of milk. Honestly, I might even eat liver if this stuff was sprinkled over it (ok, not really). It’s incredibly delicious no matter how you eat this. It makes a big old batch so you can easily share with friends. On second thought, it might just be one of those things that’s not meant to be shared and kept all to yourself. Enjoy! 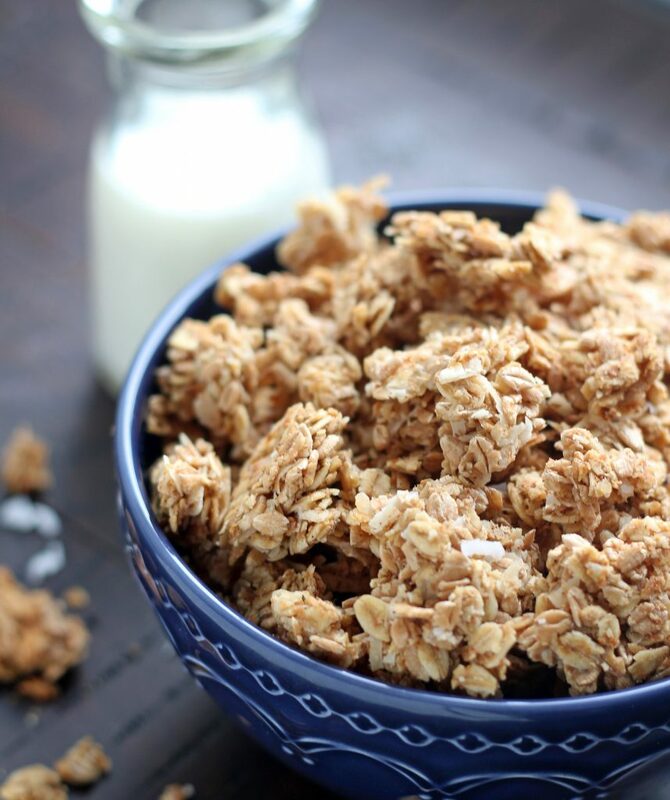 In a large bowl combine oatmeal, rolled wheat, wheat germ and coconut. Set aside. In a medium bowl combine salt, brown sugar, honey, oil, vanilla, water and cinnamon (if using). Whisk together until well combined. Pour over oat mixture and stir until mixture is evenly coated. Divide between three cookie sheets line with parchment paper or silpat liners. Press down firm using a metal spatula. Bake for 2 hours. Remove from oven and let cool for at least an hour before breaking into pieces. 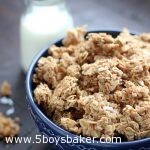 This isn't a super "chunky" granola but if you let it cool completely on the cookie sheets before breaking it up, some of it will stay in chunks. If you want a hint of cinnamon you can add 2 teaspoons to the liquid mixture (or more if you want a stronger cinnamon flavor). I love it both ways, my mom never added the cinnamon, but I did this last time I made it and really liked the super subtle cinnamon taste. Here is a link so you can see what the rolled wheat looks like. It's readily available online, but I haven't had luck finding it in all grocery stores. I ended up buying it at Winco in their bulk foods. I use sweetened coconut in this but you can also use unsweetened. Could you add fruit to this recipe and would you add it after baking? Of course you could. If you add the fruit before it bakes the fruit will come out really chewy, so if you like it that way then add it before you bake it. Adding the fruit after it bakes will keep the fruit soft. Love this! I made it today and it turned out great. I was going to make my usual granola from Perry’s Plate this week, which I love, but wanted to switch it up when I saw this one. I bought the rolled wheat at my local Whole Foods and I had all the other ingredients. I added dried cranberries to it for a little color but I just enjoyed it with some fresh fruit and yogurt. It made a ton, so we have plenty to eat up. 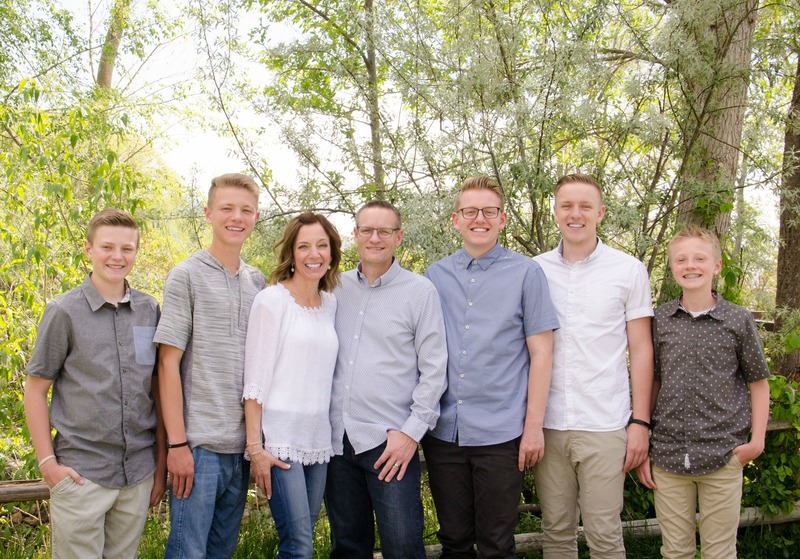 I didn’t know you were one of 9 kids–wow, no wonder you have so many great recipes from your mom cooking up for that big family!!! Hi Teresa! I love that you already made this today. So happy you like it. I’m sure it’s delicious with the cranberries. I have other granolas I make that I add cranberries to, so I always just leave this one plain because I love it as is. Thanks for leaving me a comment, it’s great to hear from you.Take care! This sounds amazing. I am definently a granola lover. Can’t wait to try this one out. This is my absolute favorite! Brings back so many memories of growing up!